EG 0,0 Marc VDS’ Xavi Vierge will once again start from pole position at the Gran Premio Motul de la República Argentina, 12 months on from securing his first pole position and after bettering Johann Zarco’s fastest ever Moto2™ lap around Termas de Rio Hondo with a 1:42.726. It’s blink and you’ll miss the gap though as both Marcel Schrötter (Dynavolt Intact GP) and Sam Lowes (Federal Oil Gresini Moto2) got almost too close to comfort with their last laps; Schrötter just 0.011 off and a single thousandth in further arrears. Vierge’s EG 0,0 Marc VDS teammate Alex Marquez will front row two of the grid thanks to a 1:42.773, making it the top four riders who all bettered Zarco’s previous best ever lap from 2015. Dynavolt Intact GP’s Tom Lüthi is in the middle of the second row, before top KTM Brad Binder who put his Red Bull KTM Ajo Moto2™ machine in P6. After showing strong pace all weekend, Remy Gardner (ONEXOX TKKR SAG Team) will start Sunday’s race from seventh on the grid. The Australian’s Q2 lap was over a tenth slower than the lap that saw him top FP3 earlier in the day. Qatar race winner and Championship leader Lorenzo Baldassarri (Flexbox HP 40) is eighth on the grid, joined on row three by compatriot and top rookie Nicolo Bulega (SKY Racing Team VR46). Rounding out the top ten after ending Q1 quickest, is veteran Simone Corsi (Tasca Racing Scuderia Moto2). With the top 13 covered by three tenths of a second, Sunday’s race at 13:20 local time (GMT-3) is not one to be missed! Jaume Masia (Bester Capital Dubai) will start the Moto3™ race at the Gran Premio Motul de la República Argentina from his first ever pole position after FP1’s fastest man struck back to set the pace on Saturday afternoon. His benchmark 1:48.775 puts him over three tenths clear of Q1 graduate Aron Canet (Sterilgarda Max Racing Team) in second, with 2018 polesitter Tony Arbolino (VNE Snipers) completing the front row in third. The qualifying session at Termas de Rio Hondo initially saw riders neglecting to set laptimes and that set up a frantic finish; classic Moto3™ style. 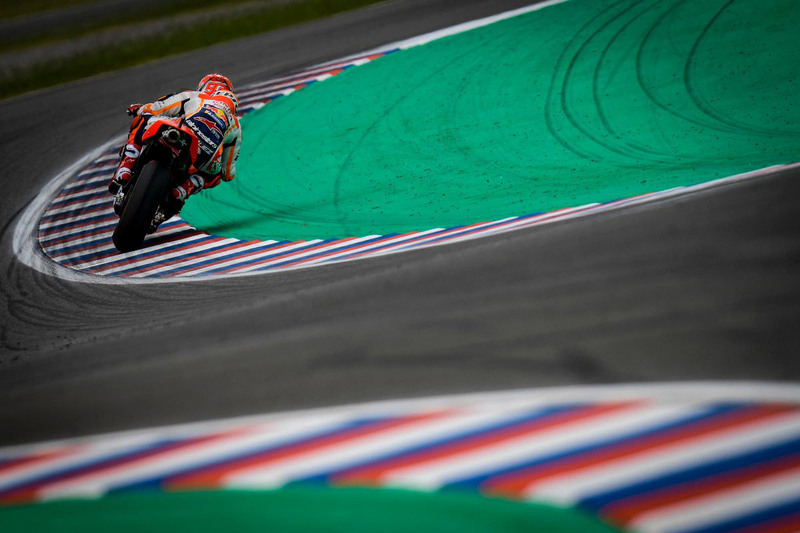 Red sectors lit up the timesheets and after first trailing Canet by 0.002, Masia then pounced soon after to leapfrog his compatriot and set the 1:48.775 – the lap that would ultimately give him his first pole position. Canet remained second, with Arbolino than snatching the final place on the front row on his final flying lap by just 0.007. The man to lose out and who now heads the second row is Lorenzo Dalla Porta (Leopard Racing). The all-Italian Row 2 is completed by fifth place Niccolo Antonelli (SIC58 Squadra Corse) and sixth on the grid, Andrea Migno (Bester Capital Dubai), another rider who came through Q1. Former Argentina GP winner Romano Fenati (VNE Snipers) starts from seventh, with Qatar GP winner Kaito Toba (Honda Team Asia) and compatriot Ayumu Sasaki (Petronas Sprinta Racing) locked close together in eighth and ninth respectively. Rookie and reigning FIM CEV Repsol Moto3™ Junior World Champion Raul Fernandez (Sama Qatar Angel Nieto Team) impressed once again to start tenth on his first appearance at Termas. Less than a second splits the top fifteen in Moto3™ qualifying and with the likes of termas podium finisher John McPhee (Petronas Sprinta Racing) and home hero Gabriel Rodrigo (Kömmerling Gresini Moto3) starting from outside the top ten, we’re set for a stunning lightweight class battle. But what will the weather bring? Tune in for the Moto3™ race at 12:00 local time (GMT-3).